Another” ten” on the scale. 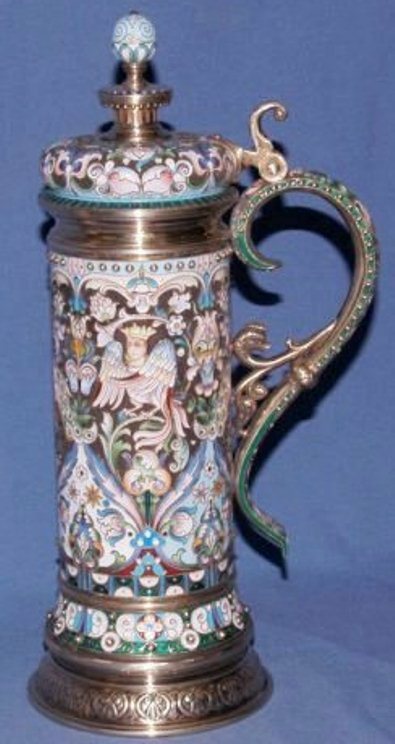 An Imperial Russian gilded silver and enamel stein by Paval Ovchinikov in Moscow, late 1800’s. One of these (and there are a couple around) was dedicated to Admiral Beatty (English WWI hero ) from the Czar of Russia. 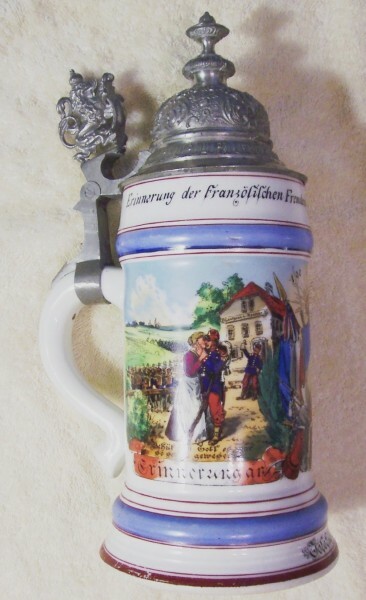 Hello all you beer stein collectors! Yeah, all you guys and gals “out there” who collect these great little historical drinking objects! Aren’t you tired of seeing that same old verbiage on the auction catalog pages, the ones that only new collectors pay any attention to? The same ones that are violated by their owners in almost every auction catalog? Do you wish to accurately rate your beer steins to sell or use for inventory purposes? Then try using this “rarity scale”, developed by two members of the Gambrinus Chapter of SCI (Norm Parartore and “himself”) with now well over 75 years of beer stein collecting experience combined. Also please note: Scarcity usually has little IF ANY relationship with prices paid for steins; while knowledge and personal appeal have everything to do with what someone pays and acquires! Norman and I have found that this “one truth” is very hard for new collectors to learn! 1. Garbage – No detail, cheaply made, and a waste of good clay or glass. Mostly “Jap crap!” This category includes those dumb assed salt and pepper shakers made to look like steins, below ▼. Not even yard sale or flea market material! Donate them to a friend that shoots, for his / her target practice! 2. Extremely common – Used to decorate home bars, or windowsills, or as gifts. Yard sale stuff, which includes Avon steins (above), Harley Davidson steins, most Franklin Mint sports and fantasy steins (below ▼ ▼), & all new pottery molded steins with a set-on-lid made at “Betty Sue’s Pottery Barn.” See just below ▼. A Betty Sue’s Pottery Barn special ! 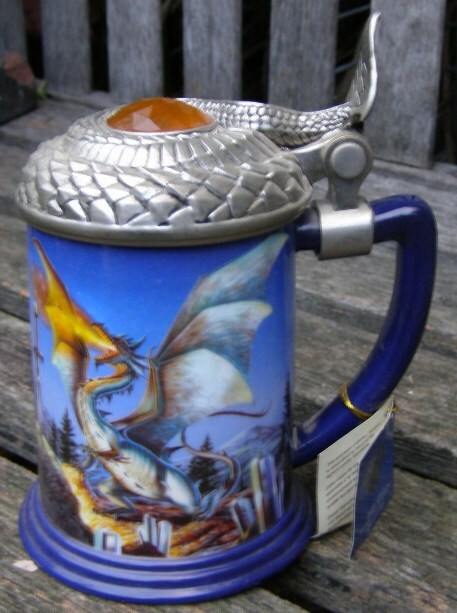 FRANKLIN MINT’S DRAGON STONE, SILVER PLATED GEMSTONE TANKARD. 3. Very Common – Seen in one out of three or four USA stein auctions. Beginning stein collectables. Higher quality and older German souvenirs. 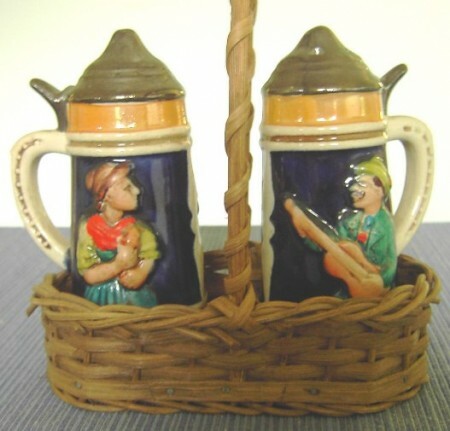 Includes most “mud steins”(Westerwald and Regensburg monotone stoneware steins, called Modell)in German, as below ▼ ▼. 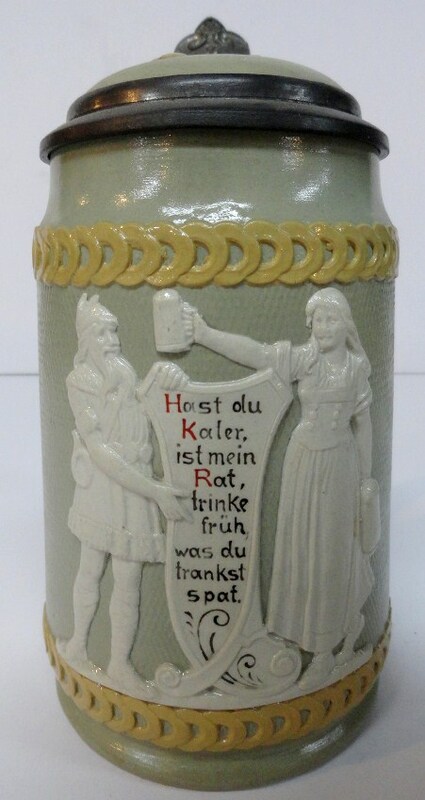 A typical .5 liter old German souvenir stein with a cheap pewter lid. It might get rated as a 3.0 for a very new collector. Seasoned collectors would not even take it down from a shelf at a shop! 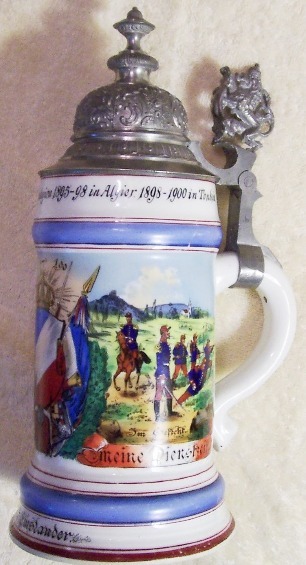 One liter Westerwald “Mud Stein.” Gambrinus and the walking steins. One of 20 most interesting of the relief scenes. 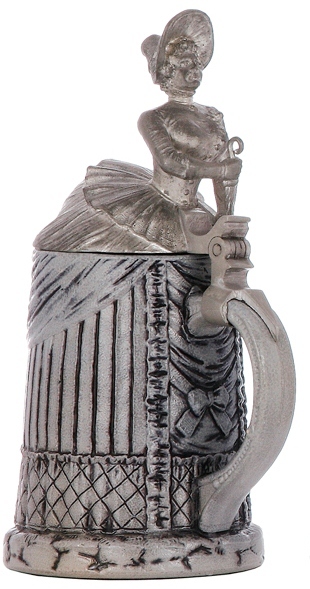 This one might rate a 3.7 as it has an original beer brewer’s occupational porcelain insert in a scalloped edge pewter lid, along with a gnome thumblift. An early bisque lid on a .5 lite, “Relief”, V & B Mettlach No. 675. Early 1870’s. Might be rated a 4.0. 4. 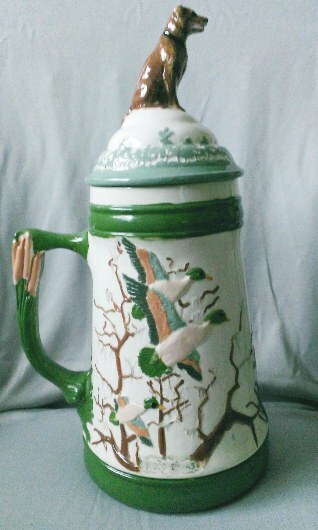 Common – seen fairly often (at least once a year) in U.S stein auctions – collectible and seen in many collections. V & B Mettlach No. 2931. A much better relief stein than the barrel above, so this might be rated a 4.5. 5. 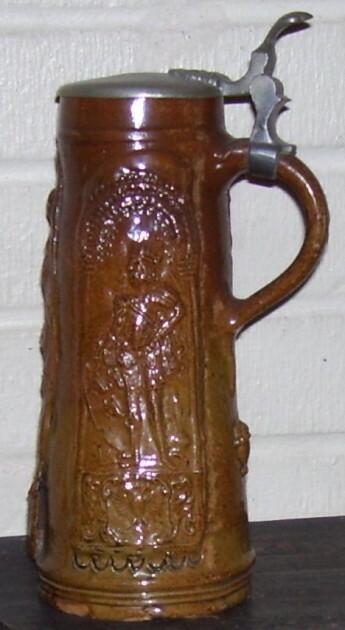 Not too common – collectable – seen in U.S. stein auctions every 1 to 3 years. 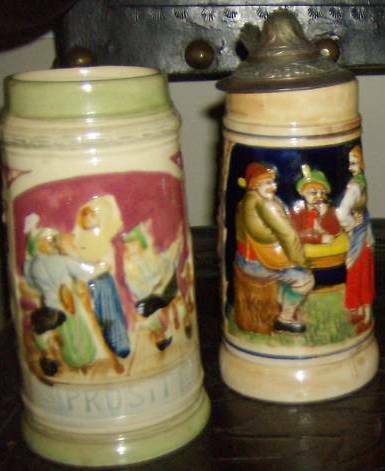 Higher end of all the major stein collecting categories: V & B Mettlach, most Reservist’s steins, Characters, Occupational, old (1700- 1800’s) stoneware, painted porcelains, and blown and engraved glass. 6. Scarce – seen in U.S. auctions once every 3 to 4 years. Special unit Reservist steins, some Royal Viennas, Royal Copenhagens Dresdens, Meissens, etc. Production (stamped) silver steins and pewter steins in good condition from the 1700’s. 7. Very scarce – seen in U.S. auctions once every 5 to 10 years. 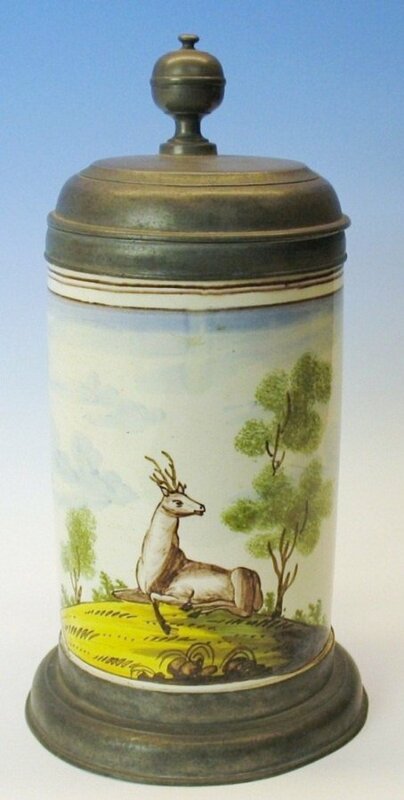 High quality and usually large: The finest Messien and Dresden porcelains, ivories, bone and some horn steins. Pewter steins from the 1600’s. Entirely hand worked silver pieces. 8. Rare – seen no more than once a decade – but of a type not acquired for museums, but maybe seen in major beer stein or European drinking vessel collections. Local terminology majors have used the words “World Class” for these type collections – although I’m really not certain what that means. 9. Very rare – best of its type = “Capstones” in major (World Class) collections. 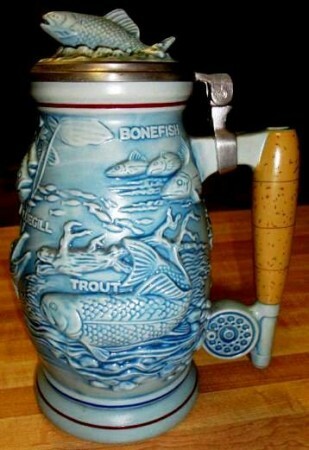 Also one of a kind steins. Local or regional museum quality. 10. Extremely rare – others like it seen in the major museums, or “Masterworks of Art, “(such as “The Monkey Cup” at the Cloisters in NYC.! 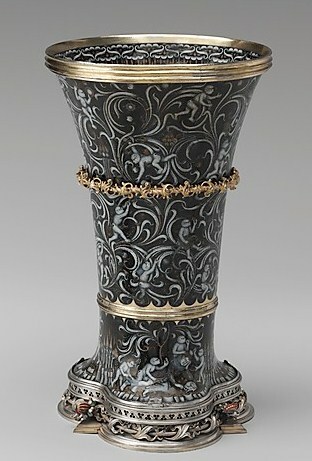 A “10” = The Monkey Cup- circa 1425-50. The MMA Cloister’s collection (NYC) .